Flail mowers in Lancashire are becoming popular in the UK. More often than not a normal lawn mower does not cope with thick grass. Flail mowers are used to deal with heavy grass and scrubs. The name described the mechanism of action of the mower. It uses flails attached to its rotating horizontal drum to cut grass. The flails are also referred to as knives or blades. The rows of flails are attached to the drum using a bracket and they are staggered to provide a complete cut. The flails are usually shaped like an extruded ‘Y’ or ‘T’ and a chain attaches to the bottom. Proprietary flails have different shapes for cutting bigger bushes and making smooth finish cuts. Redblade Mowers is the home of lawn mowers in the UK. In Lancashire, flail mowers are often used by park attendants. Parks tend to have litter and when flail mowers strike immovable objects, they bounce off. This protects the mower from any damage. Moreover, parks have thick grass that can only be trimmed by a flail mower. If you need to trim the sides of your hedge, you can put your flail mower in an upright position to make it a hedge cutter. Since we opened our doors in 1990, we have been supplying quality lawn mowers to our clients. Our products are not only efficient but also durable. Our flail mowers are guaranteed to serve you for years. 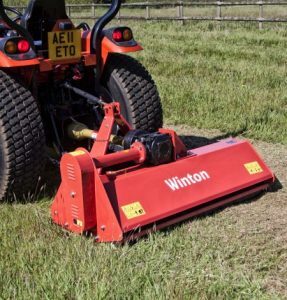 If you are looking for a lawnmower that has a rustic design, a durable system and can trim thick grass, flail mowers in Lancashire are your best bet. This lawn mower is ideal for lawns that are rocky and covered by shrubs and thick bushes. The flail mower usually has a cutting width of 65cm running around 38 blades. The displacement and the engine may vary depending on the mower. Professional flail mowers have handlebars, two large wheels with two extra pivoting wheels and a transmission system that has a reverse function. Contact us today and get your flail mower. No grass is too tough for our flail mower.